Reykjavík's Neighborhood of the Gods is an area in Iceland's capital city featuring streets named after figures from Norse mythology. 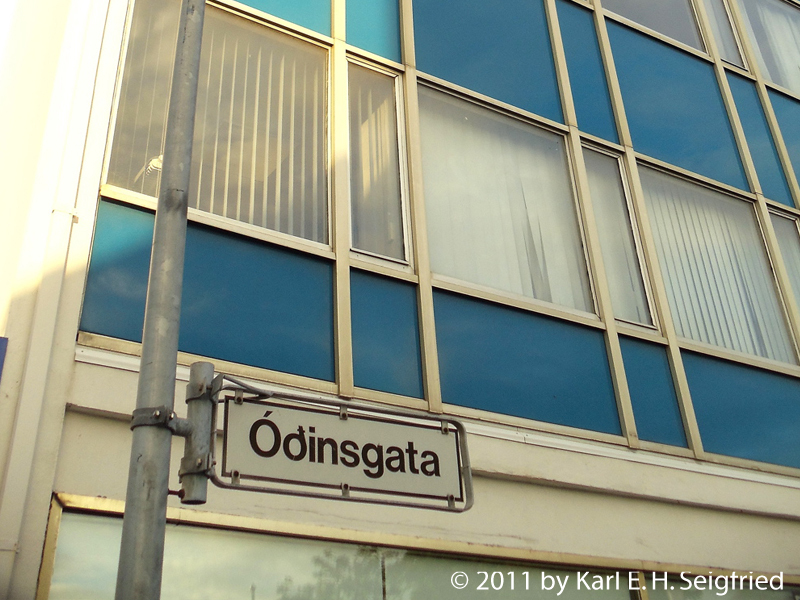 In 1906, Óðinsgata (Odin's Street) was the first street in this part of the city to be named for one of the Norse gods. Many others followed, creating what became known as the Heathen Neighborhood; Sjafnargata (Sjöfn's Street) completed the set in 1929. In the mid-1920s, the district was known for poorly-built houses and the poverty of its inhabitants, leading some to refer to it as the Blasphemy – meaning that the deteriorated condition of the neighborhood was an affront to the gods whose names it bore. With the usual tides of population change that sweep through urban areas, the neighborhood is now considered a fashionable place to live. This map shows the Neighborhood of the Gods, from Týsgata (Týr's Street) at the top to Mímisvegur (Mimir's Way) at the bottom. 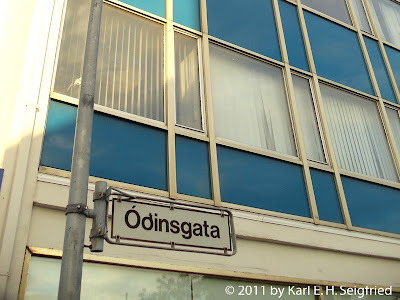 The first street in the Neighborhood of the Gods is named for Odin, the Allfather of the Norse pantheon. 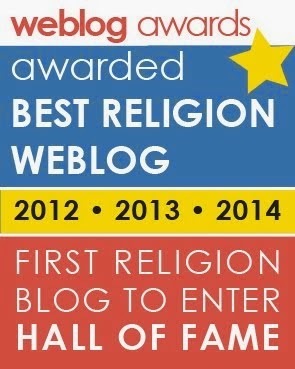 Like so many figures in Norse mythology, Odin is a complex and enigmatic figure. He is the god who stirs anger in human hearts and delights in war, but he is also the god who inspires creativity in men's minds and (according to Ynglinga Saga) speaks everything in rhyme. 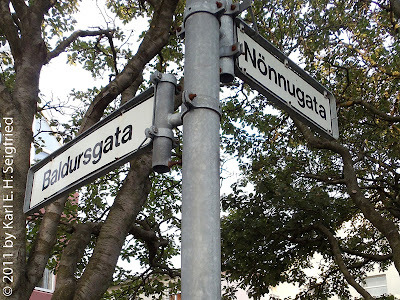 In 1912, six years after Óðinsgata was dedicated, Baldursgata (Balder's Street) became the second street in the district named for one of the Norse gods. Balder, the bright and beautiful, is better known for his death and afterlife than for any actions he accomplished while alive. Troubled by dreams, magically protected, killed by mistletoe and trapped in Hel's domain, Balder will return after Ragnarök. According to Snorri Sturluson, Nanna was the wife of Balder. She died of a broken heart at his funeral and was placed on the burning pyre alongside her husband. 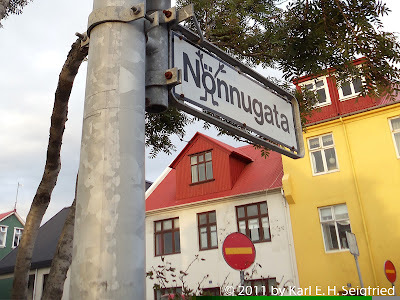 Nönnugata (Nanna's Street) was named for her in 1919. Does the graffiti on the street sign simply show teenage nonsense, or does it seek to portray Nanna lamenting the death of her beloved Balder? Fittingly enough, the streets named for Balder and Nanna intersect one another. The love shared between the god and goddess was stronger than death, and the two of them journeyed together to the dark realms of Hel, the sinister ruler of the afterlife. 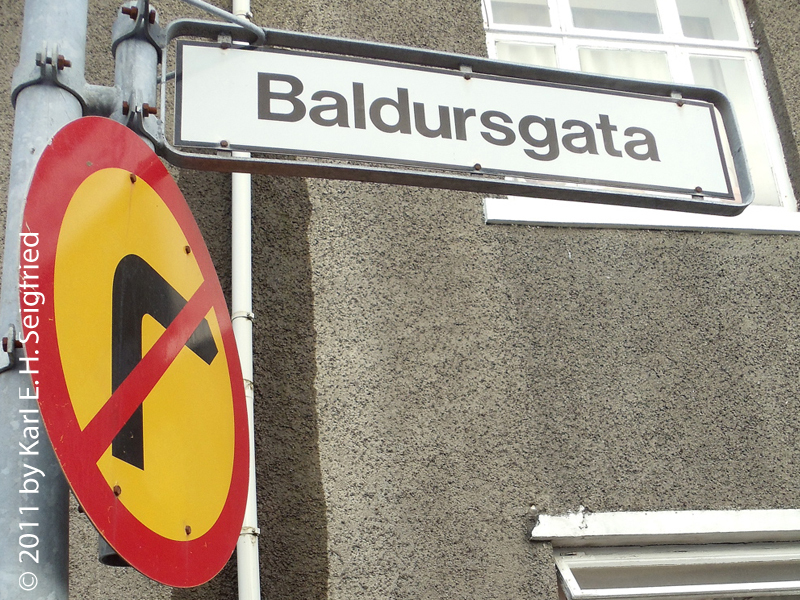 Today, Balder and Nanna remain connected in the streets of Reykjavík's Neighborhood of the Gods. 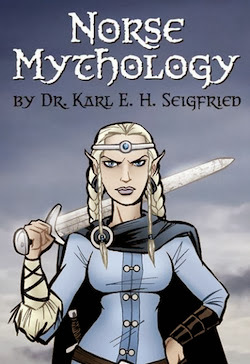 Who says Norse mythology isn't romantic? Haðarstígur (Höðr's Lane) was named in 1925 for the blind god who, according to Snorri, killed Balder by shooting him with a mistletoe missile. Höðr's hand was guided by the scheming Loki, who was jealous of the attention the gods were paying to the seemingly invulnerable Balder. 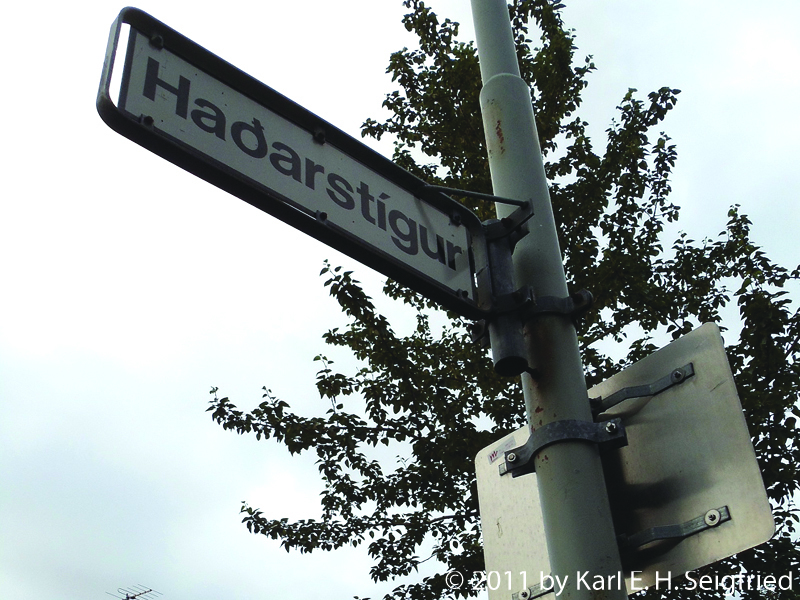 The street was likely designed for garbage pickup, sadly underscoring Höðr's status as an outsider, left out of the god's joyous games. 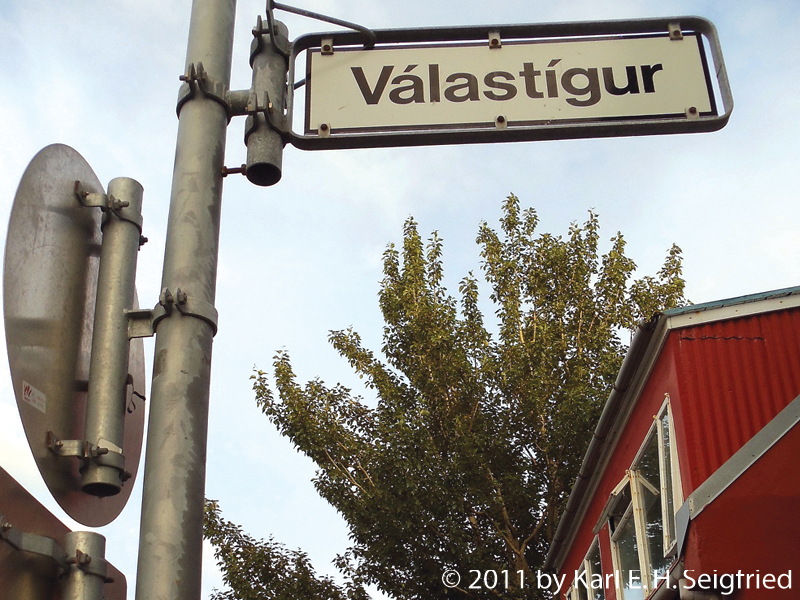 Válastígur (Váli's Lane) is named for the young god sired by Odin specifically to avenge the death of Balder, his beloved son. According to the Poetic Edda, Váli kills Höðr "when one night old." 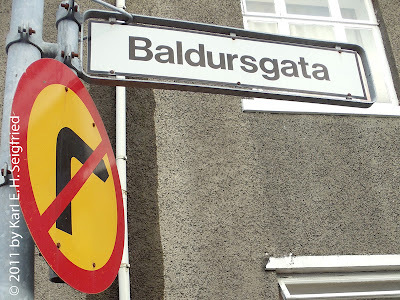 Válastígur lies directly behind Baldursgata, suggesting Váli's role as Balder's avenger - or perhaps referring to the Eddic assertion that Váli and Balder will both survive Ragnarök to rule over a new era of peace. Completing the cast of Balder's drama is Loki, "originator of deceits and the disgrace of all gods and men." In 1920, Reykjavík's mayor supposedly named Lokastígur (Loki's Lane) to get even with a greedy landowner who sought to increase profits by dividing his property. 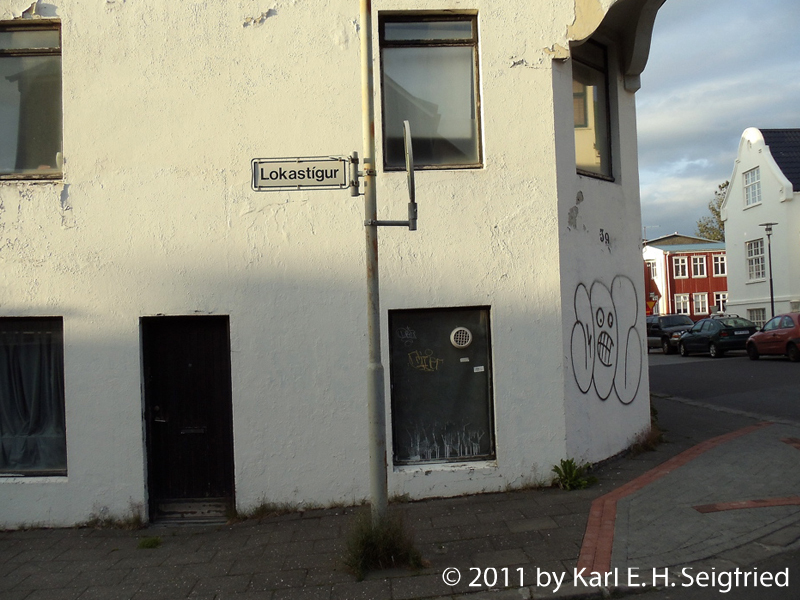 The lane hides behind Þórsgata (Thor's Street), as Loki hides behind (or from) the god of thunder in the myths. Note the graffiti monster lurking around the corner as shadows descend on Loki's Lane.